The speech “The Message of “The Seven”” written by Father John J. Burke was delivered at the Armistice Day Ceremony on November 11, 1929 at the Tomb of the Unknown Soldier in the Arlington National Cemetery. The Paulist priest Father John J. Burke was a leader of the National Catholic War Council (N.C.W.C). Through the Catholic Church Father Burke assisted with different needs that arose during war. During his speech Father Burke named seven other organizations such as the Salvation Army that assisted throughout times of war. The stated mission of the Salvation Army was to assist those in need without discrimination. It is this sentiment of helping others regardless of race or religion that creates the possibility for peace and unity within a nation. Father Burke’s speech was delivered on November 11, 1929 which was known as Armistice Day. Armistice Day established in 1919 was changed to Veterans Day following the end of World War II to honor veterans of every war. The burial in the Tomb of the Unknown Soldier was officially sanctioned by Congress on March 4, 1921. The lone soldier buried here has come to represent all those who selflessly gave their lives for our country and whose names will never be known. Father John J. Burke’s speech was delivered on the eighth anniversary of this solemn event. In this speech delivered by Father John J. Burke at the Tomb of the Unknown Solider he discusses how the country has come together and united. Burke goes on to mention how civic organizations such as the Salvation Army and the National Catholic War Council have worked for the greater good of the nation regardless of religion or race. Burke states that “never in the history of the world was there such a unified effort, military and civic, in the achievement of the one purpose as our country witnessed in the late war” (Burke, 1929). In his speech Burke highlighted how the unity within the nation led to a sense of peace. The St. John’s Mission statement and the Vincentian perspective focus on the idea that people should help one another and work together for the greater good. This is exactly what Father John J. Burke is praising our nation about during this speech after World War I. He is praising how well the nation has come together and worked together through service to one another. Burke, Fr. John, “The Message of ‘The Seven,” [PP025_059_018_03watermarked.jpg], 1929. Retrieved March 3, 2015, from Paulist Fathers Archives. The Paulist Fathers, “A Guide to the Papers of Msgr. John J. Burke, CSP, First General Secretary, National Catholic Welfare Conference,” n.d. Retrieved March 3, 2015, from Paulist Fathers Archives. 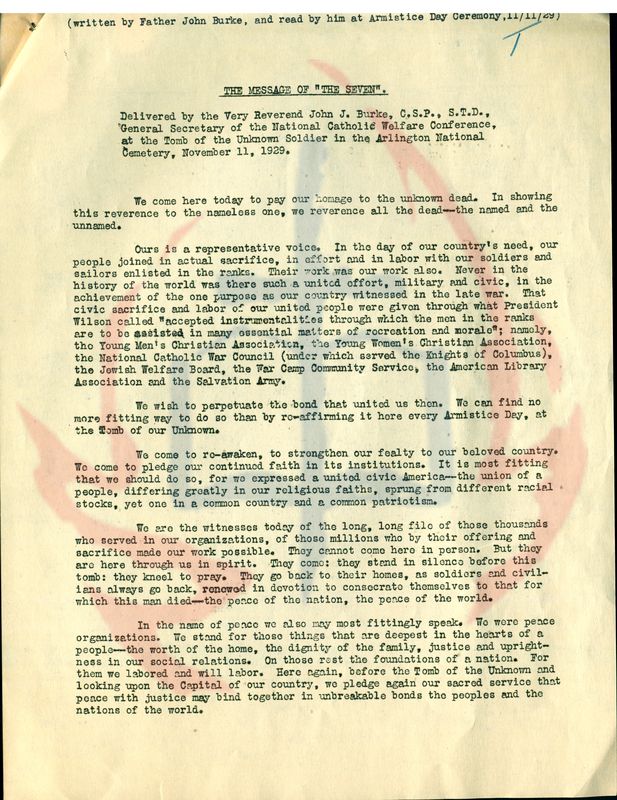 This entry was posted in Paulist Fathers and tagged Anti-discrimination, Arlington, Armistice Day, Catholicism, Civic Organizations, Father John J. Burke, national catholic war council, Peace Organizations, The Salvation Army, Tomb of the Unknown Soldier, World War I. Bookmark the permalink.